If you are looking for an easy to eat, healthy and delicious snack this holiday season, I highly recommend MySuperFoods Company and their granola bites! 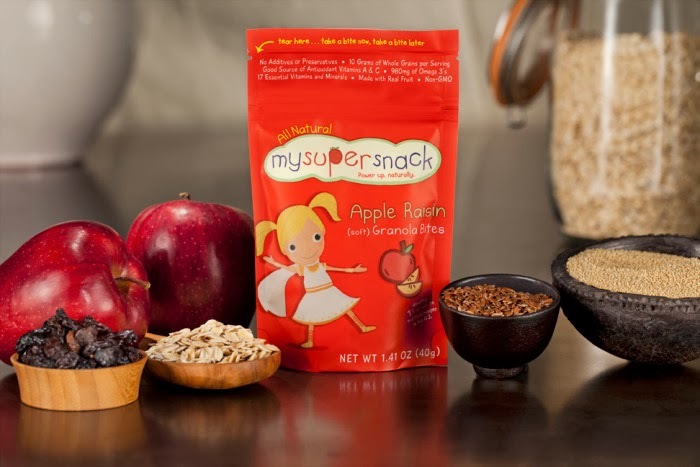 MySuperFoods Company is a healthy food and lifestyle brand devoted to producing all-natural, nutrient-dense, on-the-go food for kids age 2-12. Their goal is to create well balanced, wholesome meals and snacks that provide fiber, protein, antioxidants, vitamins, minerals, and phytonutrients, but are low in sugar and sodium, and have absolutely no tran sfats, preservatives, additives or chemicals. All of their ingredients are recognizable and pronouncable. But they don't stop there. They are one part super food, one part super hero. Equal parts nutrition and fun. As soon as your friends find out there are four soft, delicious chocolate chip bites in this pouch they may wrestle you to the ground to try one. 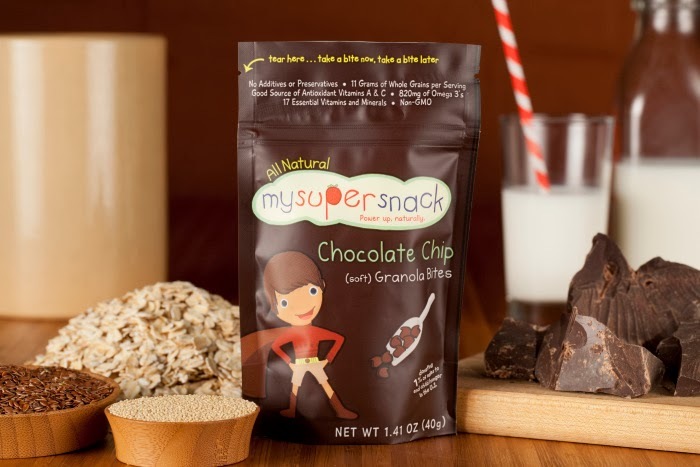 After all, any super kid knows that they not only taste like a treat right out of the oven, they are stocked with super grains and powerful vitamins to keep kids strong and satisfied throughout the day. Made with whole grain oats, omega-3 rich flax seed, amaranth (the ancient super grain) and 17 vitamins and minerals, these bites are nutritious powerhouse. But trust us, you'll want to use that resealable tab if you're saving some for later. All natural, non-GMO, no preservatives, no additives, absolutely nothing artificial. Each serving contains 10 grams of whole grains, 820mg of Omega-3's, 3 grams of protein, 3 grams of fiber and 17 essential vitamins and minerals. It's a bar, it's a cookie, it's APPLE RAISIN! This, all natural, tasty combination is like a soft oatmeal raisin cookie. Inside the BPA-free, resealable pouch, you'll find four pieces of the soft granola bites. Made with whole grain oats, real apples, amaranth (the ancient "super"grain) and omega-3 rich flax seed, every bite is packed with fiber, protein and 17 vitamins and minerals. All natural, non-GMO, no preservatives, no additives, absolutely nothing artificial. Each serving contains 10 grams of whole grains, 980mg of Omega-3's, 3 grams of protein, 3 grams of fiber and 17 essential vitamins and minerals. 100% naturally soft and delicious. This sweet combination of real fruit flavors is a crowd favorite. Like a yummy, bite-sized blueberry muffin for small hands. Inside the BPA-free, resealable pouch, you'll find four pieces of the soft granola bites. 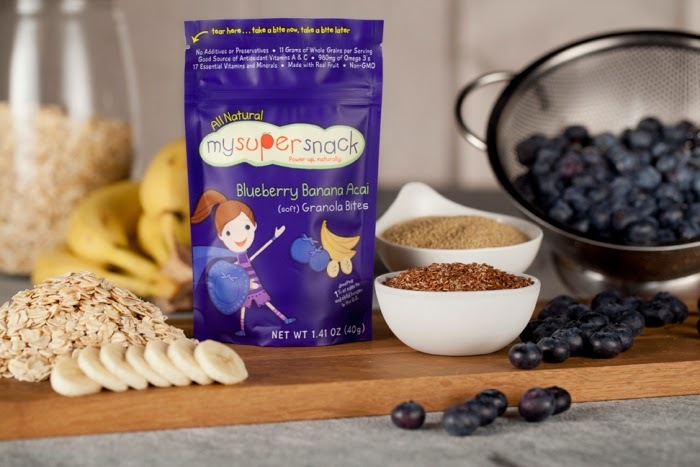 Made with whole grain oats, blueberries and bananas, amaranth (the ancient "super"grain) and omega-3 rich flax seed, every bite is packed with fiber, protein and 17 vitamins and minerals. Each bite delivers an explosion of antioxidants and nutrients that will power up any super kid enough to conquer all of their daily adventures. Buy It: You can purchase all Granola Bites from Whole Foods, Diapers.com and more.